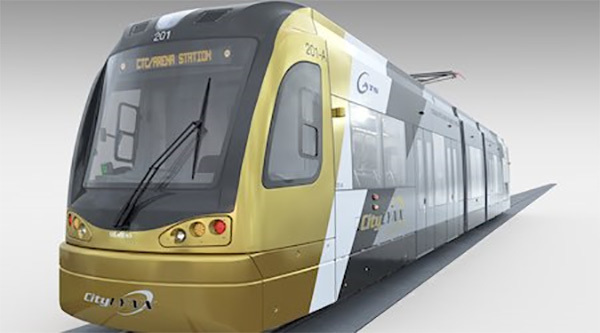 The Charlotte Observer reports that Charlotte Area Transit System (CATS) has chosen Siemens to build modern streetcars to replace Gomaco-built heritage double truck Birney replicas when the Uptown Gold Line is extended on both its east and west ends. The Siemens cars will be the streetcar version of the S70 LRV, which is currently used on modern streetcar lines in Salt Lake City and Atlanta. CATS recommends buying six Siemens streetcars equipped with pantograph and battery power for short, wire-free sections of the new extensions. The six cars would cost $41 million. CATS oeprates the LRV version of the S70 on its Lynx Blue Line light rail route, and the new streetcars would be capable of providing service on that line as well. The Gold Line version of the S70 would be shorter than the light rail version. CATS chose Siemens over Pennsylvania-based Brookville Equipment and Switzerland-based Stadler. The Gold Line extension will add 2.5 miles to the line, extending it to Sunnyside Avenue to the east and Johnson C. Smith University to the west. The budget for this phase is $150 million, with the federal government paying half. Construction is scheduled to begin January 23, 2017 with opening scheduled for August 2020. Charlotte Business Journal reported on November 29 that North Carolina's largest city is s moving forward with an expansion of the Uptown Gold Line streetcar with the award of $134 million in contracts. The 1.5-mile starter line will be extended on its east and west ends to a total of four miles with Siemens S70 streetcars replacing the Gomaco-built replica double truck Birneys now operating the starter line. The Johnson Bros. Corporation submitted a low bid of $94 million to build the additional 2.5 miles of the line. The Johnson and Siemens contracts won approval after months of uncertainty caused by higher-than-expected construction bids made in July. Two firms, Conti and Balfour, submitted bids in the summer that were 30% to 40% higher than the city’s target of $90 million. Streetcar construction is now budgeted at $80.7 million. Further infrastructure along the route includes lighting improvements, realignment of Frazier Avenue and storm and water improvements along the corridor for an additional $13.4 million.